Dr. Simms studied at the Phillips Unvierstat Marburg and received her Ph.D. in phenomenological and archetypal psychology from the University of Dallas. She joined the Duquesne Faculty in 1987. Dr. Simms' interests are interdisciplinary (philosophy, psychology, ecology, poetry, spirituality, feminism), but they converge in her writing and research on child psychology and eco-psychology. Her research group, PlaceLab, works with students to develop phenomenological concepts and methods for researching the intersection of community, nature, and place in collaboration with community organizations that steward local green spaces. Dedicated to ecopsychology and recovering the attachment between people and place, PlaceLab is looking for ways of giving voice to children's and adults' experiences of their local nature commons and help to develop community features and practices which enhance the connection between people and place. PlaceLab is pioneering qualitative research methods for the investigation of place- and nature experiences, which can help marginalized communities -- particularly children and youth -- advocate for and improve the places where they live and play. In her phenomenological studies, which are informed by the philosophy of Merleau-Ponty, she tries to create a language for dimensions of human experience that -- as long as they are unspoken -- generally remain outside the domain of human thought. She believes strongly that the interrelationship between philosophy and psychology can deepen both fields by providing better concepts to psychology and by validating philosophical concepts in the crucible of life-world situations. Dr. Simms has written on child psychology, phenomenology, ecopsychology, feminist phenomenology, Merleau-Ponty, Goethean science, and the work of the poet Rainer Maria Rilke. 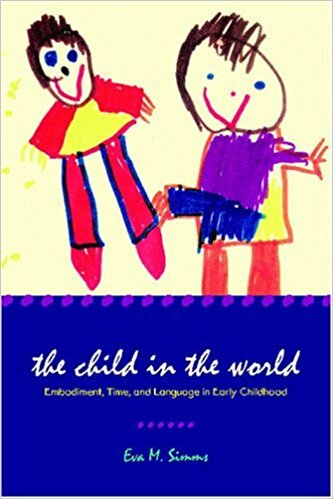 She is the author of numerous publications, including the book The child in the world: Embodiment, time, and language in early childhood. (2008).